In Washington, like all states, real property, like a house, can only be transferred in writing. The document that transfers property is called a deed. Quitclaim deeds are the simplest way to transfer property, but they carry risks that other deeds do not. Unlike warranty deeds, where the person giving the property guarantees that she owns the whole property free and clear, quitclaim deeds make no promises that the property transferred is free of liens or encumbrances, like mortgages. By accepting a quitclaim deed, you are assuming a greater risk than you would if the property was transferred by warranty deed. Quitclaim deeds are often used in divorces because they are simple, inexpensive, and usually safer than other transfer situations. When a wife transfers her interest in the property to the husband, the husband can be relatively sure that the wife has not attached any mortgages or other encumbrances to the property. This is true because it is likely that the husband would have been notified if the wife tried to encumber the property while the title was in both spouses’ names. A quitclaim deed will remove your name from a title to real property, but it will not release you from any mortgage liability on the real property. 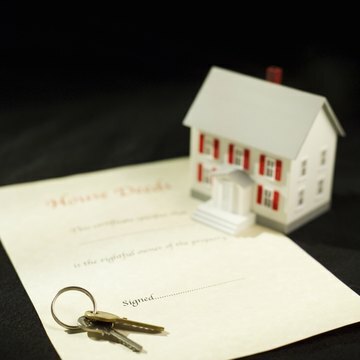 The mortgage agreement is considered a separate contract and is not tied to who has title to the real property. It is important that your spouse refinance the mortgage on the property to her name alone before you sign a quitclaim deed or you could continue to be responsible for the mortgage payments. After your spouse has refinanced any mortgages and you have executed a quitclaim deed, the deed must be delivered and recorded. The simplest way to deliver the deed is to give it directly to your former spouse. In Washington, recording the deed creates the presumption that the deed was delivered. You will record the quitclaim deed by filing it with the register of deeds in the county where the property is located. Washington law does not allow you to enforce a divorce decree order that your spouse execute a quitclaim deed unless executing the deed is related to supporting your family. However, under Washington law, you could ask the court for a money judgment against your spouse for the value of the property not transferred. A Washington court could also appoint a special officer called a “special master” to sign the quitclaim deed in your spouse’s place. The special master’s signature would have the same force and effect as your spouse’s signature.